The NBA minor league’s first season as the NBA G League heads into its Playoffs coming off a banner year. As the single-elimination action gets underway, here are the biggest storylines you need to know about this NBA G League season. The NBA G League has expanded by at least one team in each of the past five seasons. The league has added nine teams over the past two years alone — including the biggest jump of four new franchises heading into the 2017-18 season. 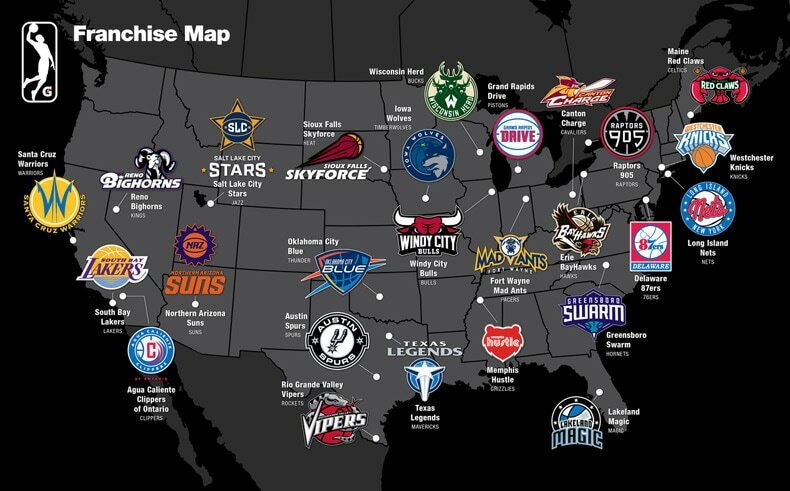 The Wisconsin Herd (Milwaukee Bucks), Agua Caliente Clippers (L.A. Clippers), Erie BayHawks (Atlanta Hawks) and Lakeland Magic (Orlando Magic) all debuted under new NBA parent clubs this season. Momentum continues to gain each season for toward the 30-for-30 direction in which each NBA team would have its own affiliate. The Washington Wizards announced on Dec. 1, 2017 that they will debut their own NBA G League affiliate starting in 2018-19, the Capital City Go-Go. The team with the best regular-season record in each division automatically qualifies for the postseason as one of six “division winners.” The additional six playoff berths will be filled by the three “wild card” teams in each conference with the best regular-season records, other than the division winners. The conferences will be seeded one through six, with the division winners owning the first, second and third seeds and the wild card teams occupying the fourth, fifth and sixth seeds based on regular-season records. The top two seeds in each conference will earn a bye into the second round. The playoffs will begin with three single-elimination rounds before culminating with a best-of-three NBA G League Finals, which will be played in a one-one-one format. Two-way players adding a new twist. With the NBA G League’s new two-way contracts, there has been a slew of NBA talent playing with their NBA G League teams. Through the deals, which debuted this season, each NBA team is allowed up to two players that can be moved up and down between the NBA team and the NBA G League club. The player is allowed up to 45 days with the NBA team while staying under a two-way deal. From Warriors guard Quinn Cook to Bulls dynamic scorer Antonio Blakeney, two-way talent made an immediate impact. NBA assignments: The NBA G League rehab path back to the Association. This season, NBA teams have utilized assignments to NBA G League teams unlike ever before. Whether a player is coming back from injury or refining his game, NBA teams have assigned an all-time high 98 different players throughout the season. Big NBA names like Blake Griffin, Zach LaVine, Jabari Parker, D’Angelo Russell and Isaiah Thomas utilized the assignment system to rehab injuries with the NBA G League franchises. Players attempting to work their way onto an NBA roster, like Thomas Bryant, Isaiah Whitehead and others, have used their NBA G League affiliates to gain experience in game action and showcase their skills and abilities. NBA veterans using NBA G League on their paths back to the NBA. NBA veterans like Trey Burke, Emeka Okafor and Brandon Jennings all played as unsigned prospects in the NBA G League this season, leading their teams both in the locker room and on the floor, grabbing the attention of NBA teams in the process. Burke was called-up by the New York Knicks on Jan. 14, Emeka Okafor was called-up by the New Orleans Pelicans on Feb. 3 and Brandon Jennings was called-up by the Milwaukee Bucks on March 11. 46 prospects have earned Call-Ups to the NBA. NBA G League prospect players gained the attention of NBA scouts and personnel throughout the season. Players like Trey Burke, Kyle Collinsworth, Emeka Okafor, Shaquille Harrison, Jaylen Morris and Travis Wear earned their spots with the NBA clubs that called them up, eventually were signed to contracts for the remainder of the NBA season. League leaders: Blakeney, Magette stand out from the pack. Bulls two-way player Antonio Blakeney was a force to be reckoned with offensively when with Windy City. His NBA G League leading 32.0 points per game was unmatched by the rest of the league. The LSU product went for at least 30 points in 21 of his 32 appearances, including dropping 40-plus points seven times. In Windy City’s 130-126 overtime win over the Oklahoma City Blue on Nov. 10, Blakeney set a Bulls’ record with 44 points, before breaking that in his very next NBA G League game, scoring 46 against the Maine Red Claws on Dec. 6. Atlanta Hawks two-way player Josh Magette continued his dominance in NBA G League play, leading the league in assists per game for the third-straight season. His 10.2 assists per game was the best mark of his four-year NBA G League career, and he set an Erie BayHawks record of 19 assists in the BayHawks’ 134-133 overtime loss to the Delaware 87ers on Dec. 23. Minnesota Timberwolves two-way player Amile Jefferson was an unstoppable force in the paint all season long. His 12.8 rebounds per game (3.6 offensive) led the NBA G League, and his 36 double-doubles in 47 games were a new league record. The Duke product started the season as a prospect player with the Iowa Wolves, before earning a Gatorade Call-Up, signing a two-way contract with the Timberwolves on Jan. 15. Northern Arizona Suns point guard Josh Gray led the NBA G League in steals (2.4 per game) this season, while adding a pair of triple-doubles as well. Gray also earned a Gatorade Call-Up this season, signing a 10-day contract with the Phoenix Suns on Feb. 2. Oklahoma City Thunder two-way player Daniel Hamilton has showed his consistent versatility with the Blue this season, with a league-leading 10 triple-doubles. The UConn product started the season as one of the hottest players, going for five triple-doubles in his first eight games. He’s nearly averaging a triple-double this season, with 16.1 points, 9.0 rebounds and 8.0 assists in 45 games with the Blue. High-scoring performances all year long. From Trey Burke’s Westchester-record 43 points in November, to Antonio Blakeney’s two-straight Windy City Bulls record scoring nights, to Isaiah Whitehead’s 52 points, and to Trey Davis’ 57-point outburst, the NBA G League has seen its fair share of high-scoring, entertaining performances throughout the season. With teams taking the big stage during the playoffs, high-scoring, team-on-your-back performances could be upcoming.